There has been a lot of discussion on what will happen next at Kilauea. 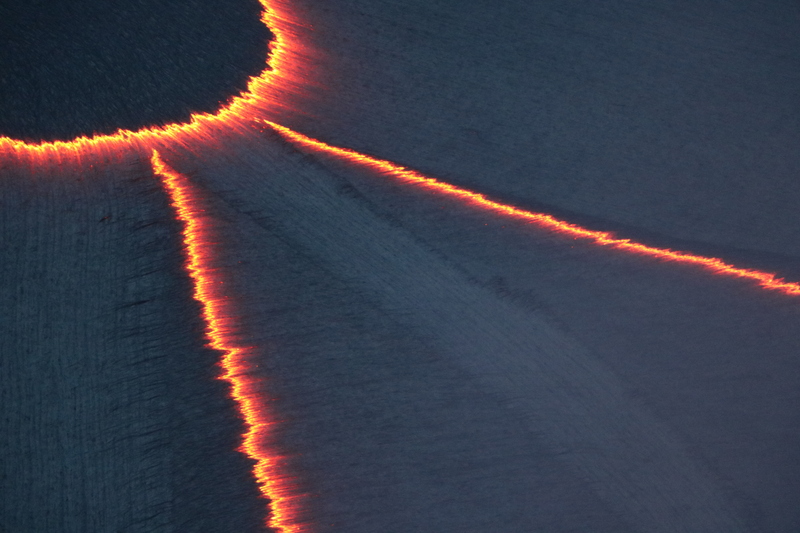 For 30 years it overflowed through Pu’u’O’o, leaving the summit safely under-pressured. That had been changing slowly as Pu’u’O’o declined, and the summit had become restless. A lava lake made its appearance and slowly enlarged itself. But this mode, with pressure at the summit and a partially open conduit at Pu’u’O’o, became unstable (imagine a tyre with a double puncture). The overfull summit reservoir channeled more magma to Pu’u’O’o, it couldn’t cope and the east rift zone gave way, in the process triggering the major earthquake. That was in April/May. Now we are half a year later, with Leilani half destroyed, the Puna Geothermal Energy Plant out of business through excess heat, Kapoho gone (presumably this time forever), Pu’u’O’o dead, Kilauea caldera collapsed, and HVO having abandoned its headquarters and taken up residence in Hilo. The park was closed for 134 days. It has now reopened and the iconic Volcano House is again taking reservations. Only the tropic birds still fly: they have lived through all events and seem unperturbed, taking it all on the wing. Who would have predicted all this, even 6 months ago? Kilauea remains utterly unpredictable. Every year, decade, or even century seems different. Attempts to look at past behaviour to predict the future run into the trouble of insufficient history. If nothing else, the past year has shown that this volcano does not do re-runs. It is an adventurer, always looking for new expressions. Kilauea is the unforeseeable volcano. When you go (as I hope you will) you will gaze at history, a reminder of the events which left this gaping hole. The views of the caldera are clearer than they have been for decades. But it wasn’t always just a scar. A century or more ago, people came to gaze at the spectacle of an everlasting summit eruption. Kilauea was where the red blood of the Earth flowed on the surface. People came from far and wide. One of the more famous visitors was an adventurer whose quest for new experiences matched that of the mountain itself. The letters he wrote turned an active volcano into a tourist attraction, and the travel writer into a national celebrity. Who would have predicted it? Samuel Clemens was in fact a rather unlikely volcano explorer. He grew up in the entirely non-volcanic region of Missouri, and his early career choice was to be a Mississippi river pilot. When this didn’t quite work out, he moved to riverless Nevada and tried his hand at mining, before finally finding his calling as a travel writer. He became best known by his pen name, Mark Twain. Samuel was commissioned by the Sacramento Union to go to the Sandwich Islands, as Hawai’i was known, and report on life in the deep Pacific. He wrote 25 letters detailing the stormy journey and the people and customs of the island, culminating in the visit to Kilauea. The letters are readily available (out of copyright) and still well worth reading. They give a picture of a world in rapid change, and his writings bring countless characters to vivid life. He was a gifted writer who could tell a gripping story with a minimum of words. The object of our tramp was to visit a great natural curiosity at the base of the foothills – a congealed cascade of lava. Some old forgotten volcanic eruption sent its broad river of fire down the mountain side here, and it poured down in a great torrent from an overhanging bluff some fifty feet high to the ground below. The flaming torrent cooled in the winds from the sea, and remains there to day, all seamed, and frothed and tippled – a petrified Niagara. It is very picturesque, and withal so natural that one might almost imagine it still flowed. A smaller stream trickled over the cliff and built up an isolated pyramid about thirty feet high, which has the resemblance of a mass of large gnarled and knotted vines and roots and stems intricately twisted and woven together. We passed in behind the cascade and the pyramid, and found the bluff pierced by several cavernous tunnels, whose crooked courses we followed about fifty feet, but with no notable result, save that we made a discovery that may be of high interest to men of science. We discovered that the darkness in there was singularly like the darkness observable in other particularly dark places – exactly like it, I thought. I am borne out in this opinion by my comrade, who said he did not believe there was any difference but if there was, he judged it was in favor of this darkness here. Two of these winding tunnels stand as proof of Nature’s mining abilities. Their floors are level, they are seven feet wide, and their roofs are gently arched. Their height is not uniform, however. We passed through one a hundred feet long, which leads through a spur of the hill and opens out well up in the sheer wall of a precipice whose foot rests in the waves of the sea. It is a commodious tunnel, except that there are occasionally places in it where one must stoop to pass under. The roof is lava, of course, and is thickly studded with little lava-pointed icicles an inch long, which hardened as they dripped. They project as closely together as the iron teeth of a corn-sheller, and if one will stand up straight and walk any distance there, he can get his hair combed free of charge. The story of his volcanic exploration is picked up again in one of the subsequent letters. The party now approaches Kilauea from the southwest, following a path parallel to the south coast. Brown bought a horse from a native at Waiohinu for twelve dollars, but happening to think of the horse jockeying propensities of the race, he removed the saddle and found that the creature needed “half-soling,” as he expressed it. Recent hard riding had polished most of the hide off his back. He bought another and the animal went dead lame before we got to the great volcano, forty miles away. I bought a reckless little mule for fifteen dollars, and I wish I had him yet. One mule is worth a dozen horses for a mountain journey in the Islands. The first eighteen miles of the road lay mostly down by the sea, and was pretty well sprinkled with native houses. The animals stopped at all of them – a habit they had early acquired; natives stop a few minutes at every shanty they come to, to swap gossip, and we were forced to do likewise – but we did it under protest. Brown’s horse jogged along well enough for 16 or 17 miles, but then he came down to a walk and refused to improve on it. We had to stop and intrude upon a gentleman who was not expecting us, and who I thought did not want us, either, but he entertained us handsomely, nevertheless, and has my hearty thanks for his kindness. We looked at the ruddy glow cast upon the clouds above the volcano, only twenty miles away, now (the fires had become unusually active a few days before) for awhile after supper, and then went to bed and to sleep without rocking. We stopped a few miles further on, the next morning, to hire a guide, but happily were saved the nuisance of traveling with a [native Hawai’ian] we could not talk with. [Here I have ‘updated’ a term which may have been in common use in those days but which would be disrespectful nowadays. Even Mark Twain has to abide by VC’s first rule, ‘be nice’.] The proprietor and another gentleman intended to go to the volcano the next day, and they said they would go at once if we would stop and take lunch. We signed the contract, of course. It was the usual style. We had found none but pleasant people on the island, from the time we landed at. To get through the last twenty miles, guides are indispensable. The whole country is given up to cattle ranching, and is crossed and recrossed by a riddle of “bull paths” which is hopelessly beyond solution by a stranger. Portions of that little journey bloomed with beauty. Occasionally we entered small basins walled in with low cliffs, carpeted with greenest grass, and studded with shrubs and small trees whose foliage shone with an emerald brilliancy. One species, called the mamona, with its bright color, its delicate locust leaf, so free from decay or blemish of any kind, and its graceful shape, chained the eye with a sort of fascination. The rich verdant hue of these fairy parks was relieved and varied by the splendid carmine tassels of the ohia tree. Nothing was lacking but the fairies themselves. As we trotted up the almost imperceptible ascent and neared the volcano, the features of the country changed. We came upon a long dreary desert of black, swollen, twisted, corrugated billows of lava – blank and dismal desolation! Stony hillocks heaved up, all seamed with cracked wrinkles and broken open from center to circumference in a dozen places, as if from an explosion beneath. There had been terrible commotion here once, when these dead waves were seething fire; but now all was motion less and silent – it was a petrified sea! The narrow spaces between the upheavals were partly filled with volcanic sand, and through it we plodded laboriously. The invincible ohia struggled for a footing even in this desert waste, and achieved it – towering above the billows here and there, with trunks flattened like spears of grass in the crevices from which they Sprang. We came at last to torn and ragged deserts of scorched and blistered lava – to plains and patches of dull grey ashes – to the summit of the mountain, and these tokens warned us that we were nearing the palace of the dread goddess Pele, the crater of Kilauea. That particular letter ends at this point. Kilauea was not the quiet caldera it is nowadays. It was full of activity, lava lakes, outbursts, all at the summit. Volcano House was close to the action, and lookout point, at the rim of the caldera, must have had a spectacular view, albeit with an air quality that may not have met modern health standards. The story from here becomes spectacular. The Sacramento Union did not publish the continuation until almost a month later. It was worth the wait. As we “raised” the summit of the mountain and began to canter along the edge of the crater, I heard Brown exclaim, “There’s smoke, by George!” (poor infant – as if it were the most surprising thing in the world to see smoke issuing from a volcano), and I turned my head in the opposite direction and began to crowd my imagination down. When I thought I had got it reduced to about the proper degree, I resolutely faced about and came to a dead halt. “Disappointed, anyhow!” I said to myself “Only a considerable hole in the ground – nothing to Haleakala – a wide, level, black plain in the bottom of it, and a few little sputtering jets of fire occupying a place about as large as an ordinary potato-patch, up in one corner – no smoke to amount to any thing. And these ‘tremendous’ perpendicular walls they talk about, that inclose the crater! they don’t amount to a great deal, either; it is a large cellar – nothing more – and precious little fire in it, too.” So I soliloquized. But as I gazed, the “cellar” insensibly grew. I was glad of that, albeit I expected it. I am passably good at judging of heights and distances, and I fell to measuring the diameter of the crater. After considerable deliberation I was obliged to confess that it was rather over three miles, though it was hard to believe it at first. It was growing on me, and tolerably fast. And when I came to guess at the clean, solid, perpendicular walls that fenced in the basin, I had to acknowledge that they were from 600 to 800 feet high, and in one or two places even a thousand, though at a careless glance they did not seem more than two or three hundred. The reason the walls looked so low is because the basin inclosed is so large. The place looked a little larger and a little deeper every five minutes, by the watch. And still it was unquestionably small; there was no getting around that. About this time I saw an object which helped to increase the size of the crater. It was a house perched on the extreme edge of the wall, at the far end of the basin, two miles and a half away; it looked like a martin box under the eaves of a cathedral! That wall appeared immensely higher after that than it did before. I have seen Vesuvius since, but it was a mere toy, a child’s volcano, a soup-kettle, compared to this. Mount Vesuvius is a shapely cone thirty-six hundred feet high; its crater an inverted cone only three hundred feet deep, and not more than a thousand feet in diameter, if as much as that; its fires meagre, modest, and docile.–But here was a vast, perpendicular, walled cellar, nine hundred feet deep in some places, thirteen hundred in others, level- floored, and ten miles in circumference! Here was a yawning pit upon whose floor the armies of Russia could camp, and have room to spare. I reflected that night was the proper time to view a volcano, and Brown, with one of those eruptions of homely wisdom which rouse the admiration of strangers, but which custom has enabled me to contemplate calmly, said five o’clock was the proper time for dinner, and therefore we spurred up the animals and trotted along the brink of the crater for about the distance it is from the Lick House, in San Francisco, to the Mission, and then found ourselves at the Volcano House. On the way we passed close to fissures several feet wide and about as deep as the sea, no doubt, and out of some of them steam was issuing. It would be suicidal to attempt to travel about there at night. As we approached the lookout house I have before spoken of as being perched on the wall, we saw some objects ahead which I took for the brilliant white plant called the “silver sword,” but they proved to be “buoys” – pyramids of stones painted white, so as to be visible at night, and set up at intervals to mark the path to the lookout house and guard unaccustomed feet from wandering into the abundant chasms that line the way. By the path it is half a mile from the Volcano House to the lookout-house. After a hearty supper we waited until it was thoroughly dark and then started to the crater. The first glance in that direction revealed a scene of wild beauty. There was a heavy fog over the crater and it was splendidly illuminated by the glare from the fires below. The illumination was two miles wide and a mile high, perhaps; and if you ever, on a dark night and at a distance beheld the light from thirty or forty blocks of distant buildings all on fire at once, reflected strongly against overhanging clouds, you can form a fair idea of what this looked like. Arrived at the little thatched lookout house, we rested our elbows on the railing in front and looked abroad over the wide crater and down over the sheer precipice at the seething fires beneath us. The view was a startling improvement on my daylight experience. I turned to see the effect on the balance of the company, and found the reddest-faced set of men I almost ever saw. In the strong light every countenance glowed like red-hot iron, every shoulder was suffused with crimson and shaded rearward into dingy, shapeless obscurity! The place below looked like the infernal regions and these men like half-cooled devils just come up on a furlough. I turned my eyes upon the volcano again. The “cellar” was tolerably well lighted up. For a mile and a half in front of us and half a mile on either side, the floor of the abyss was magnificently illuminated; beyond these limits the mists hung down their gauzy curtains and cast a deceptive gloom over all that made the twinkling fires in the remote corners of the crater seem countless leagues removed – made them seem like the campfires of a great army far away. Here was room for the imagination to work! You could imagine those lights the width of a continent away – and that hidden under the intervening darkness were hills, and winding rivers, and weary wastes of plain and desert – and even then the tremendous vista stretched on, and on, and on! – to the fires and far beyond! You could not compass it – it was the idea of eternity made tangible – and the longest end of it made visible to the naked eye! The greater part of the vast floor of the desert under us was as black as ink, and apparently smooth and level; but over a mile square of it was ringed and streaked and striped with a thousand branching streams of liquid and gorgeously brilliant fire! It looked like a colossal railroad map of the State of Massachusetts done in chain lightning on a midnight sky. Imagine it – imagine a coal-black sky shivered into a tangled network of angry fire! Here and there were gleaming holes a hundred feet in diameter, broken in the dark crust, and in them the melted lava – the color of a dazzling white just tinged with yellow – was boiling and surging furiously; and from these holes branched numberless bright torrents in many directions, like the spokes of a wheel, and kept a tolerably straight course for a while and then swept round in huge rainbow curves, or made a long succession of sharp worm-fence angles, which looked precisely like the fiercest jagged lightning. These streams met other streams, and they mingled with and crossed and recrossed each other in every conceivable direction, like skate tracks on a popular skating ground. Sometimes streams twenty or thirty feet wide flowed from the holes to some distance without dividing – and through the opera glasses we could see that they ran down small, steep hills and were genuine cataracts of fire, white at their source, but soon cooling and turning to the richest red, grained with alternate lines of black and gold. Every now and then masses of the dark crust broke away and floated slowly down these streams like rafts down a river. Occasionally, the molten lava flowing under the superincumbent crust broke through – split a dazzling streak, from five hundred to a thousand feet long, like a sudden flash of lightning and then acre after acre of the cold lava parted into fragments, turned up edgewise like cakes of ice when a great river breaks up, plunged downward and were swallowed in the crimson cauldron. Then the wide expanse of the “thaw” maintained a ruddy glow for a while, but shortly cooled and became black and level again. During a “thaw”, every dismembered cake was marked by a glittering white border which was superbly shaded inward by aurora borealis rays, which were a flaming yellow where they joined the white border, and from thence toward their points tapered into glowing crimson, then into a rich, pale carmine, and finally into a faint blush that held its own a moment and then dimmed and turned black. Some of the stream preferred to mingle together in a tangle of fantastic circles, and then they looked something like the confusion of ropes one sees on a ship’s deck when she has just taken in sail and dropped anchor – provided one can imagine those ropes on fire. Through the glasses, the little fountains scattered about looked very beautiful. They boiled, and coughed, and spluttered, and discharged sprays of stringy red fire of about the consistency of mush, for instance – from ten to fifteen feet into the air, along with a shower of brilliant white sparks – a quaint and unnatural mingling of gouts of blood and snowflakes! We had circles and serpents and streaks of lightning all twined and wreathed and tied together, without a break throughout an area more than a mile square (that amount of ground was covered, though it was not strictly “square”), and it was with a feeling of placid exultation that we reflected that many years had elapsed since any visitor had seen such a splendid display – since any visitor had seen anything more than the now snubbed and insignificant “North” and “South” lakes in action. We had been reading old files of Hawaiian newspapers and the “Record Book” at the Volcano House, and were posted. I forgot to say that the noise made by the bubbling lava is not great, heard as we heard it from our lofty perch. It makes three distinct sounds – a rushing, a hissing, and a coughing or puffing sound, and if you stand on the brink and close your eyes, it is no trick at all to imagine that you are sweeping down a river on a large low – pressure steamer, and that you bear the hissing of the steam about her boilers, the puffing from her escape pipes and the churning rush of the water abaft her wheels. The smell of sulphur is strong but not unpleasant to a sinner. We left the lookout house at ten o’clock in a half cooked condition because of the heat from Pele’s furnaces, and wrapping up in blankets (for the night was cold) returned to the hotel. After we got out in the dark we had another fine spectacle. A colossal column of cloud towered to a great height in the air immediately above the crater, and the outer swell of every one of its vast folds was dyed with a rich crimson luster, which was subdued to a pale rose tint in the depressions between. It glowed like a muffled torch and stretched upward to a dizzy height toward the zenith. I thought it just possible that its like had not been seen since the children of Israel wandered on their long march through the desert so many centuries ago over a path illuminated by the mysterious “pillar of fire.” And I was sure that I now had a vivid conception of what the majestic “pillar of fire” was like, which almost amounted to a revelation. It is only at very long intervals that I mention in a letter matters which properly pertain to the advertising columns, but in this case it seems to me that to leave out the fact that there is a neat, roomy, well furnished and well kept hotel at the volcano would be to remain silent upon a point of the very highest importance to any one who may desire to visit the place. The surprise of finding a good hotel in such an outlandish spot startled me considerably more than the volcano did. The house is new – built three or four months ago – and the table is good. One could not easily starve here even if the meats and groceries were to give out, for large tracts of land in the vicinity are well paved with excellent strawberries. One can have as abundant a supply as he chooses to call for. There has never heretofore been anything in this locality for the accommodation of travellers but a crazy old native grass hut, scanty fare, hard beds of matting and a Chinese cook. The last letter ends here. But in Roughing it, Mark Twain adds a twist, and tells the untold part of the story. This was extreme tourism, well beyond the remit of the Sacramento Union: they never published it (as far as I know) and perhaps Mark Twain never told them about his silly exploit. The most amazing part about the untold adventure was that Mark Twain survived it. Anyone stupidly trying to follow his example would be at severe risk of dying, and perhaps it was indeed wisest to keep this skeleton in the closet. The next night was appointed for a visit to the bottom of the crater, for we desired to traverse its floor and see the “North Lake” (of fire) which lay two miles away, toward the further wall. After dark half a dozen of us set out, with lanterns and native guides, and climbed down a crazy, thousand-foot pathway in a crevice fractured in the crater wall, and reached the bottom in safety. The eruption of the previous evening had spent its force and the floor looked black and cold; but when we ran out upon it we found it hot yet, to the feet, and it was likewise riven with crevices which revealed the underlying fires gleaming vindictively. A neighboring cauldron was threatening to overflow, and this added to the dubiousness of the situation. So the native guides refused to continue the venture, and then everybody deserted except a stranger named Marlette. He said he had been in the crater a dozen times in daylight and believed be could find his way through it at night. He thought that a run of three hundred yards would carry us over the hottest part of the floor and leave us our shoe soles. His pluck gave me backbone. We took one lantern and instructed the guides to hang the other to the roof of the lookout house to serve as a beacon for us in case we got lost, and then the party started back up the precipice and Marlette and I made our run. We skipped over the hot floor and over the red crevices with brisk dispatch and reached the cold lava safe but with pretty warm feet. Then we took things leisurely and comfortably, jumping tolerably wide and probably bottomless chasms, and threading our way through picturesque lava upheavals with considerable confidence. When we got fairly away from the cauldrons of boiling fire, we seemed to be in a gloomy desert, and a suffocatingly dark one, surrounded by dim walls that seemed to tower to the sky. The only cheerful objects were the glinting stars high overhead. By and by Marlette shouted “Stop!” I never stopped quicker in my life. I asked what the matter was. He said we were out of the path. He said we must not try to go on till we found it again, for we were surrounded with beds of rotten lava through which we could easily break and plunge down a thousand feet. I thought eight hundred would answer for me and was about to say so when Marlette partly proved his statement by accidentally crushing through and disappearing to his armpits. He got out and we hunted for the path with the lantern. He said there was only one path, and that it was but vaguely defined. We could not find it. The lava surface was all alike in the lantern light. But he was an ingenious man. He said it was not the lantern that had informed him that we were out of the path, but his feet. He had noticed a crisp grinding of fine lava-needles under his feet, and some instinct reminded him that in the path these were all worn away. So he put the lantern behind him, and began to search with his boots instead of his eyes. It was good sagacity. The first time his foot touched a surface that did not grind under it he announced that the trail was found again; and after that we kept up a sharp listening for the rasping sound, and it always warned us in time. It was a long tramp. but an exciting one. We reached the North Lake between ten and eleven o’clock, and sat down on a huge overhanging lava-shelf, tired but satisfied. The spectacle presented was worth coming double the distance to see. Under us, and stretching away before us, was a heaving sea of molten fire of seemingly limitless extent. The glare from it was so blinding that it was some time before we could bear to look upon it steadily. It was like gazing at the sun at noonday, except that the glare was not quite so white. At unequal distances all around the shores of the lake were nearly white-hot chimneys or hollow drums of lava, four or live feet high, and up through them were bursting gorgeous sprays of lava-gouts and gem spangles, some white some red, and some golden – a ceaseless bombardment, and one that fascinated the eye with its unapproachable splendor. The more distant jets, sparkling up through an intervening gossamer veil of vapor, seemed miles away; and the further the curving ranks of fiery fountains receded, the more fairylike and beautiful they appeared. Now and then the surging bosom of the lake under our noses would calm down ominously and seem to be gathering strength for an enterprise; and then all of a sudden a red dome of lava of the bulk of an ordinary dwelling would heave itself aloft like an escaping balloon, then burst asunder, and out of its heart would flit a pale green film of vapor, and float upward and vanish in the darkness – a released soul soaring homeward from captivity with the damned, no doubt. The crashing plunge of the ruined dome into the lake again would send a world of seething billows lashing against the shores and shaking the foundations of our perch. By and by, a loosened mass of the hanging shelf we sat on tumbled into the lake, jarring the surroundings like an earthquake and delivering a suggestion that may have been intended for a hint, and may not. We did not wait to see. We got lost again on our way back, and were more than an hour hunting for the path. We were where we could see the beacon lantern at the lookout house at the time, but thought it was a star, and paid no attention to it. We reached the hotel at two o’clock in the morning, pretty well fagged out. Kilauea never overflows its vast crater, but bursts a passage for its lava through the mountainside when relief is necessary, and then the destruction is fearful. About 1840 it rent its overburdened stomach and sent a broad river of fire careering down to the sea, which swept away forests, huts, plantations, and everything else that lay in its path. The stream was five miles broad, in places, and two hundred feet deep, and the distance it traveled was forty miles. It tore up and bore away acre-patches of land on its bosom like rafts – rocks, trees, and all intact. At night the red glare was visible a hundred miles at sea; and at a distance of forty miles fine print could be read at midnight. The atmosphere was poisoned with sulphurous vapors and choked with falling ashes, pumice stones, and cinders; countless columns of smoke rose up and blended together in a tumbled canopy that hid the heavens and glowed with a ruddy flush reflected from the fires below; here and there jets of lava sprung hundreds of feet into the air and burst into rocket-sprays that returned to earth in a crimson rain; and all the while the laboring mountain shook with nature’s great palsy, and voiced its distress in moanings and the muffled booming of subterranean thunders. Fishes were killed for twenty miles along the shore, where the lava entered the sea. The earthquakes caused some loss of human life, and a prodigious tidal wave swept inland, carrying everything before it and drowning a number of natives. The devastation consummated along the route traversed by the river of lava was complete and incalculable. Only a Pompeii and a Herculaneum were needed at the foot of Kilauea to make the story of the eruption immortal. What a story he had to tell. Vesuvius had Pompei, but Kilauea had Mark Twain. The Letters from Hawai’i can be found at http://www.twainquotes.com/sduindex.html. The later reworking is available at http://www.online-literature.com/twain/roughing-it/, chapter LXXIV. May 15, 2018. Golf and Kilauea. As an appendix, here is a modern retelling of Mark Twain’s proposal to improve English. This version was written a decade or two ago. Both this and its original feel as fresh as ever. (I should confess that there is some disagreement whether the original piece came in fact from Twain. To me it does sound like him.) Enjoy. In the first year, “s” will replace the soft “c”– Sertainly this will make the sivil servants jump with joy. The hard “c” will be dropped in favor of the “k”. This should klear up konfusion and keyboards kan have 1 less letter. There will be growing publik enthusiasm in the sekond year, when the troublesome “ph” wil be replaced with the “f”. This will make words like “fotograf” 20% shorter. In the 3rd year, publik akseptanse of the new spelling kan be expected to reach the stage where more komplikated changes are possible. Governments will enkorage the removal of double letters, which have always been a deterent to akurate speling. Also, al wil agre that the horible mes of the silent “e”‘s in the language is disgraceful, and they should go away. By the 4th yar peopl wil be reseptiv to steps such as replasing “th” with “z” and “w” with “v”. During ze fifz yar, ze unesesary “o” kan be dropd from vords kontaining “ou” and similar changes vud of kors be aplid to ozer kombinations of leters. A lava lake can only exist beacuse of many very special factors. You needs hot and fluid lavas that can allow that convection. A very very constant magma supply where magma is feed all the time. The volcano also needs hot and completely open conduits, where magma can convect and rise and fall. Its a very rare phenomena. Hawaii and Kilauea generaly haves the largest lava lakes when its going. The last earthquakes have been very shallow (2 km) while the swarms preceeding the last 2 eruptions were much deeper, centered at around 6-8 km deep if I recall correctly. The swarm is a clear signal that the system is pressurized right now and closing to an eruption but it could be a matter of days, months or years before that eruption happens. An eruption in the rift zones will be preceeded by strong seismic activity in the rift zone before the eruption and maybe a magnitude 6 quake from the Kaoiki, Hiilea or Kona areas as the flank moves aside and we would be at least a few months from the eruption onset. But this could also be a radial eruption in the making in the northwest flank in which case I am guessing it might be much more immediate and I don’t know if it will give that many presursors. The next Mauna Loa eruption may be a repeat of the 1950 s event. Fas and furious and huge volume of lava in short time. Wow. This is quite a sequence. It is on a north-south line, which is getting shallower towards the south, i.e. the summit. So not a dike but a fault line. There is also a burst of very deep quakes on the south coast, not quite at Pahala this time but closer to Kilauea. If you look at the whole swarm that has been going on since 2017 (with less intensity back then) there is no clear trend in the depth along that north-south line. I on the other hand see a temporal trend of the hipocenters getting shallower but it is not that obvious either. At least compared to past swarms before the eruptions of 1975 and 1984 earthquakes have been shallower and particularly today’s. The Pahala swarm has had in past years 2 branches, one goes to the south offshore and another one towards Kilauea. 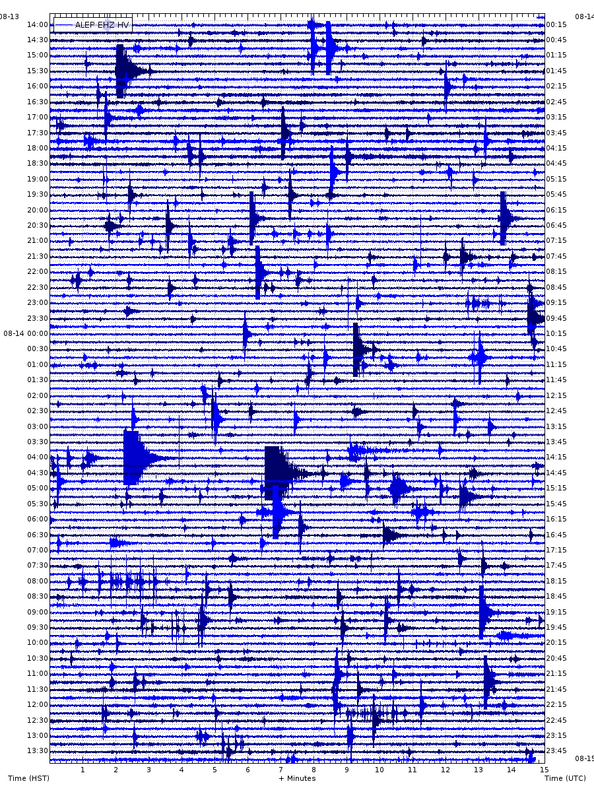 It seems there must have been an improvement in the seismograph network a few years ago because small quakes are only registered at that depth since then so I don’t think there is a way to know of how the Pahala swarm relates to activity in Kilauea with measurements taken for such a short time. I hadn’t noticed a trend of the depth before now either. It is visible in the current swarm which started two weeks ago slight northward and deeper. But that does not mean it is present consistently: just in this particular swarm. I looked at it because of the possibility if a dike forming in this direction but it does not look like it. The swarm that took place in september of 1983 preceding the 1984 eruption by 6 months happened in the same area but was apparently centered at 8 km depth, much deeper than today’s quakes or the ones in past October. That is why I think there might be some kind of temporal trend in depth and I don’t think a dike should be ruled out (It is after all an area where dikes have intruded in the past and fed radial eruptions). But it still might be just faults adjusting to stresses from the summit or maybe there is really a dike that might still fail to erupt. In any case I think there would be two main scenarios here, either the summit is pressurized and “ready” for a rift eruption that might happen months or years from now or there is an intrusion in the northwest flank that will erupt instead of one of the rifts, in which case as I said above and don’t know what warnings to expect or how much time could it be before happening. Seems the link I uploaded cuts part of the 2016-2017 swarm out. At Night Halemauamu was an amazing lightshow, with glowing spreading cracks in the lakes skinn. The cracks is where new crust is made and spreads from, incandensent at start and then fading into black. Halemaumau had usualy a few large crustal plates and millions of them when they lake have been distubed. The crust is likley only a few milimeters thick. That crust is also very flexible, I seen bubbles lifting that crust without breaking through. Part 1 out of 2 show-casing two different eruption forecast models for the Grimsvötn Volcano on Iceland. Next instalment will be up in a week by Albert.